With the death of Robin in Batman Incorporated #8 this week, a number of fans have expressed reservations about the fairly violent way that a 10-year-old child was dispatched in the story. 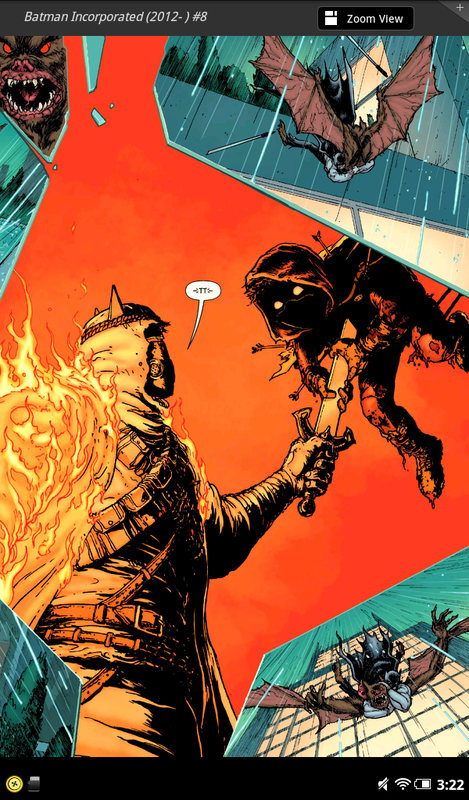 While it's been a vocal minority, with most fans understanding that Damian as a character didn't conform to the normal rules for pre-teens (among other things, he's killed people), their concerns have been well-taken, and certainly the bloody, damaging nature of the fight that laid the Boy Wonder low did little to quiet them down. Still, it's hardly the first time we've seen a kid killed in comics, and some of them have been handled with a lot less class, and/or featured kids a lot younger, than Damian Wayne's. This has to head up the list, because the entire thing was just...insane. Following the death of Lian Harper in Justice League: Cry For Justice, her father (former Teen Titan Arsenal) went totally apenuts, most notably by carrying around a dead cat that he mistakenly thought to be his daughter. Not only was her death unnecessary and in bad taste--and not only was it a pretty obvious example of "fridging" a supporting character just to give your lead some angst--but virtually every part of the story leading up to it, the story where it happened and the story following up from it were absolutely terrible. In this instance, the relationship between Terry Long and Donna Troy--never particularly a fan-favorite--had become something that the writers wanted to get rid of and the kids got caught in the figurative crossfire. Terry was out driving with his children (and, by extension, the adopted children of Donna Troy), and their car went over a cliff, killing all three of them. 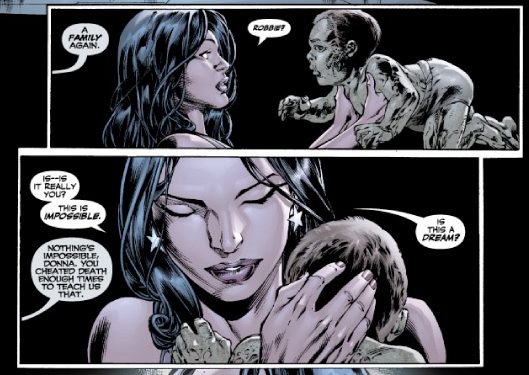 That might not in and of itself have been considered in particularly poor taste, but certainly it wasn't helped any by the subsequent decision to bring baby Robbie back as a zombie in Blackest Night. 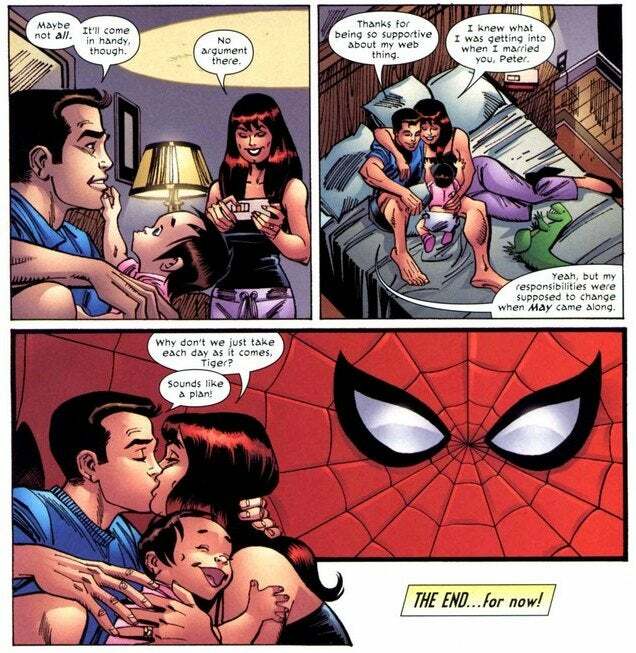 The daughter of Peter and Mary Jane Parker has a bit of a tortured history; when MJ became pregnant, the clone saga was ongoing. Ultimately MJ was poisoned by Alison Mongraine, an agent of the Green Goblin, and the baby was stillborn (or seemed to be, as Mongraine took the sedated infant away with her). 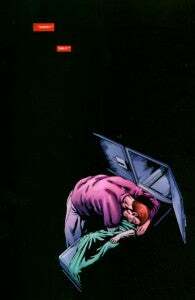 It's never been revealed to Peter and Mary Jane that the baby was actually alive, and since the child never reappeared after the initial "stolen by the Green Goblin" reveal, it seems likely that the kid is being treated as having died, in spite of having survived. That's all a bit iffy, particularly considering that it appears at least from the outside that giving the Parkers a dead baby was done essentially to convince Peter to become Spider-Man again after a hiatus. Another great example of flagrant fridging? It's hard to say--it seems the writers wanted to follow up on the story but were denied by editorial. As an added bonus, Peter and Mary Jane effectively "aborted" another (?) 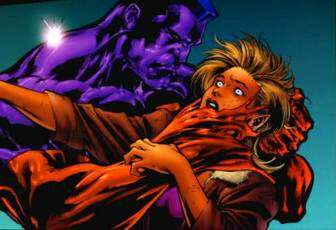 child, shown to them by Mephisto as part of what they would lose having surrendered their married life to save Aunt May. Whether that child is another one or in fact a vision of May, who they could have found if they had "remembered" their marriage, is unclear. This one's an odd one. She's back now, of course, and also she didn't look like a kid when she died...but that's all part of what made her life and untimely death so incredibly squicky. At around 13, Arisia joined the Green Lantern Corps and took a liking to Hal Jordan. She used her ring to age herself to adulthood, in the hopes that it would attract his romantic attentions...and it worked, establishing Hal as a bit of a creep in the minds of many fans. Ultimately, after she and Hal broke up, she was never able to de-age herself back to her "natural" age. When the Green Lantern Corps was disbanded, she ended up working at Warriors Bar (was she old enough to serve the alcohol? Given the compressed timeline of comics, the answer seems likely to be no...) and ultimately died there at the hands of Major Force, becoming the second young woman in a short period of time that he killed and stuffed in a fridge (although this time it was the walk-in cooler at the bar, which wasn't nearly as uncomfortable). Seriously, what the hell is going on at DC Comics? 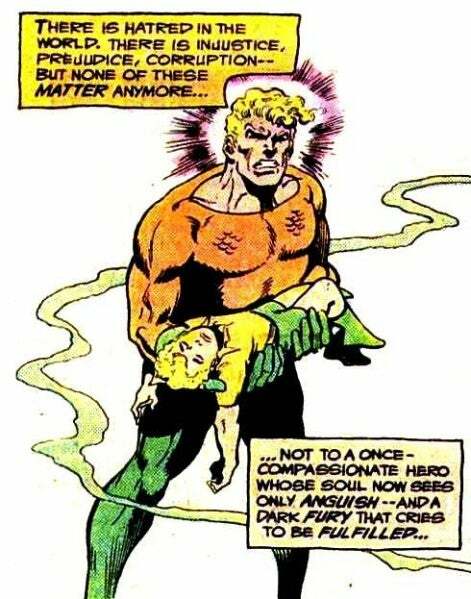 Aquaman's son, murdered by Black Manta, was the youngest kid killed directly by a supervillain and unambiguously shown as dead on-panel in a mainstream superhero comic. Wonder why they never did that again? 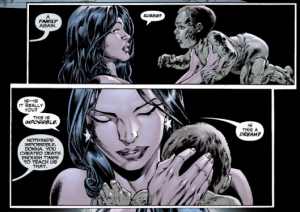 And yes, for good measure...that baby did come back as a Black Lantern. All class.